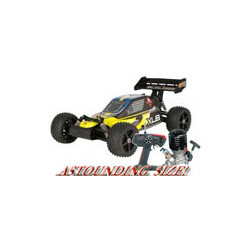 You’ll understand why bigger is better, after driving the Traxxas 1/6-scale Monster Buggy. It’s unlike anything you have ever experienced. 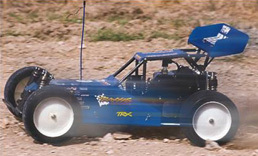 Monster Buggy weighs in at 22 pounds, and is over 2 feet long. When this beast hits the track, everything else runs for cover. The heart of the Monster Buggy is its 23cc, 2-cycle, 3 Horse Power with the New Zenoah G230RC Engone. Quickly accelerates to 50 MPH. This proven-reliable, high-revving, easy-starting engine is the top performer in the industry. 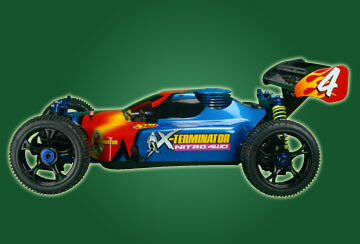 It’s equipped with many convenience features, such as a recoil pull starter and magneto ignition. Just because it’s big, doesn’t mean it’s clumsy. 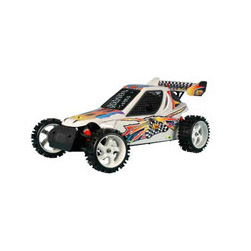 Monster Buggy has all the pro-level sophistication and features you would expect. The four-wheel independent suspension has extra-long travel for superior handling and jumping. Gigantic, aluminum, oil-filled shocks can be precisely tuned for maximum performance. Bellcrank steering, with dual-servo capability, delivers lightning-fast response. For all-out performance, the durable transmission has variable gear ratios, an adjustable slipper clutch, and an oversized disk brake. 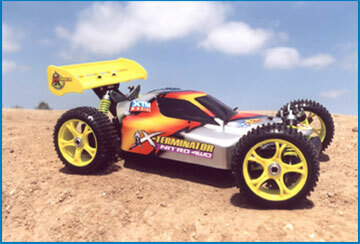 Of course, it’s all Traxxas Tough, with a heavy-duty aluminum chassis, full ball bearings, and fiber- composite parts. Monster Buggy comes completely assembled. Just install your two-channel radio system, pour in your fuel, and you’re ready for earth- shaking excitement.